In Estonia, exports have expanded much faster than expected since the end of 2010. This has led to a substantial upward revision of economic growth forecasts. A revival of gross fixed investment acts as an additional growth driver as well as household consumption. 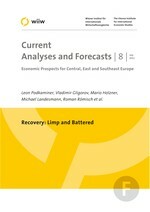 For 2011 we expect GDP to grow by 5.7% in Estonia. In the subsequent two years, when growth in external demand will be abating, we expect only a slight deceleration to 4.5% and 4.8% p.a. Despite the revival in growth, the situation in the labour markets will remain disappointing for a longer period.